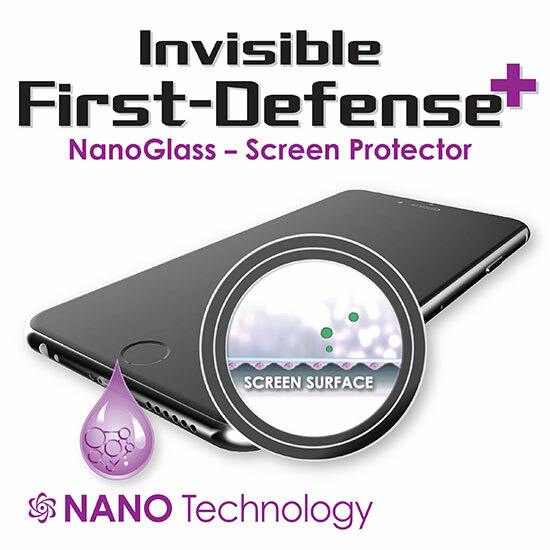 Invisible First-Defense+ NanoGlass’ technology of 100% SiO2, creates an invisible protective coating that will enhance your screen to 9H (Sapphire) hardness and 99.9% antibacterial. Invisible First-Defense+ Extreme now features the ability to reduce the device’s radiation by 90%. All properties and attributes have been tested by top 3rd party testing facilities. Once applied with a DuPont Serona, anti-fibrous, high absorbency cloth, it becomes 100% invisible, undetectable, bubble free and does not interfere with the functionality of your screen. 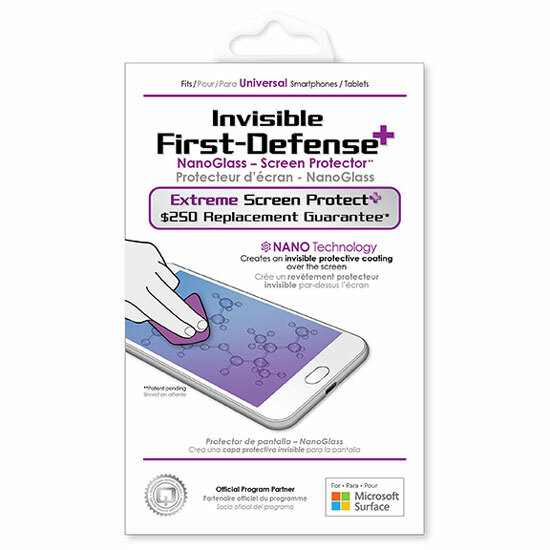 Invisible First-Defense+ NanoGlass - Screen Protector can be applied to all types of phones and tablets up to 10". The universal fit makes it ideal for devices with curved or hard-to-fit displays. If your device's screen is damaged while protected by Invisible First-Defense+ NanoGlass - Screen Protector, your limited warranty will provide coverage towards the repair of the device's screen (based on level of protection you purchased). Invisible First-Defense+-Screen Protection warranties are backed by a highly ranked and experienced member of the National Association of Insurance Commissioners with 40 years experience, A+ BBB rating, A.M., ensuring that the warranty program will never change. For answers to frequently asked questions, visit Invisible First-Defense+ NanoGlass FAQ's. The Protection of Tomorrow is Here Today! NANO TECHNOLOGY: creates an INVISIBLE protective coating and will enhance your screen to 9H HARDNESS (Sapphire), WATER REPELLENT, 99.9% BACTERIA REPELLENT, REDUCES 90% OF RADIATION, and SCRATCH RESISTANT. After easy WIPE ON Application it becomes 100% Invisible, Undetectable, Bubble free and does NOT interfere with the functionality of your screen. NO Sticking. UNIVERSAL: Screen Protector Compatible with ALL Apple, Samsung, Sony and Other branded Phones, Tablets, Camera Screens Lenses, E-Readers, Amazon Kindle and LCD Screens. If the warranty registration card is missing from an order purchased from 3rd party sellers, Qmadix will NOT replace. Must be purchased from Qmadix or authorized retailer. Copyright © 2018 Qmadix Inc.